PEST Analysis: involves the analysis of four external factors that may impact your business: Political, Economic, Social and Technological. It should not be confused with a SWOT Analysis, that concerns itself with factors at a more micro level, whereas the PEST process considers the macro environment. 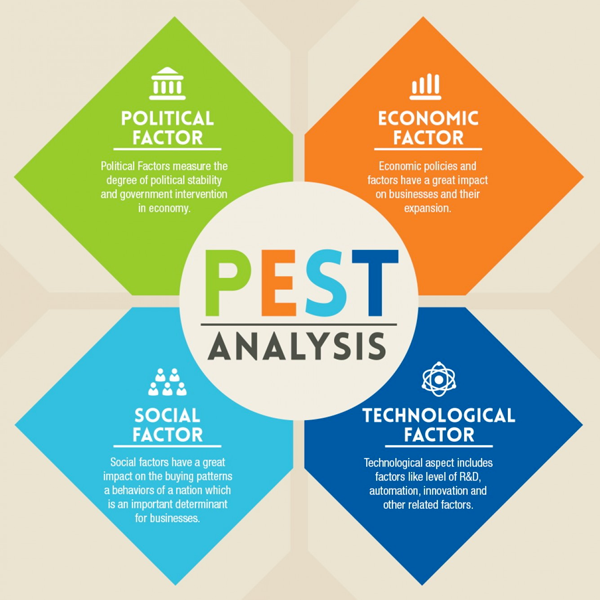 These PEST Analysis political factors could be things such as: local or national elections and the issues on which politicians propose to implement policies such as legal constraints, environmental regulations, business and personal taxation, product labeling and customer protection. Where your business may operate overseas, consider the international environment. The long list of factors may include: consumer confidence, economic stability of change, exchange rates, interest rates, inflation, investment levels, consumer confidence and disposable income, credit, tax rates national and local, globalization of tariffs. Some may seem remote factors to include in your PEST Analysis and sometimes you can conclude that for specific reasons related to your business, they will not affect you. I started my main business in 1982 at the lowest ebb of the British economy since the war, but our small scale and highly specialized offering was not directly impacted. Such PEST Analysis social factor issues might concern: demographic trends, unemployment levels or trends, consumer behavior in the light of the other three areas of change, social habits or prejudices and changing laws that reflect them, changing cultural norms. There is public data to draw upon, but your own observation is important here, particularly in your sector of activity. Your own changes in attitude and behavior over the last few years may be good indicators, too. Technological factors that could be influential include: the immediacy and spread of online retailing, IT in energy and the impact of things like net metering, distributed generation and clean power, web platforms that enable micro-business to thrive in fields traditionally only open to large operators, nanotech and wearable computing. You will know about tech changes in your own sphere of operations. Big companies that have significant research resources will turn PEST Analysis into a considerable task, using big data, artificial intelligence and the like. BUT they are just like you, even with all that budget. Nowadays you can tap into big data via the web, for even a tiny budget. And another BUT is that both the big corporates and the startup minnows have to interpret all that data. This is where often the entrepreneur is fleeter of foot than the strategy wonks in multinationals. Start with data and rely on your gut instinct. There are other variants of PEST Analysis. One that’s a bit more complex is STEEPLE Analysis: Socio-cultural, Technological, Economic, Environmental, Political, Legal, Ethical factors. The inclusion of ethical factors will be particularly important for purpose-driven new ventures. In any event, there is always a risk of you getting analysis paralysis to avoid decision making, but ignoring the outside world could also be a grave mistake in your business planning process. Remember that whatever way you analyze external factors that may impact your startup, each one can be subjected to SWOT or SOAR Analysis to determine its significance in your particular case. You can also use Force Field Analysis on top of your factors to get at how you can minimize the impact of negative factors and enhance the positive ones. Critical Success Factors can also guide your choice of the external (and internal) issues that you should consider as you think about strategy.